The Cobalt Blue Tarantula or, by its original name Haplopelma lividum is a medium sized tarantula that originates in the tropical rain forests of Southeast Asia. Its name, as well as its popularity, comes from his dark blue or black body and beautify blue legs which can get a span of 5 inches (13 cm). They aren’t recommended for beginners because they tend to be very aggressive and fast. Experienced owners on the other hand, know how to handle them and take proper care. 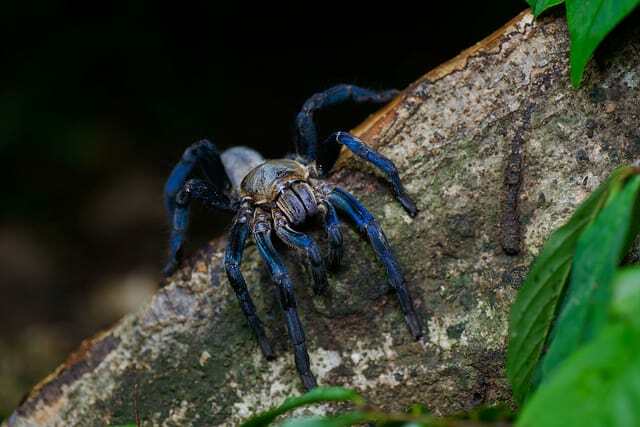 The Cobalt Blue Tarantula can mostly be found in Myanmar and sometimes over the border in Thailand. 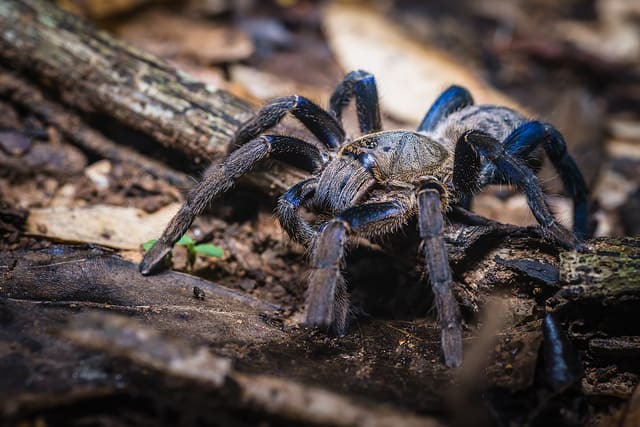 The Cobalt Blue Tarantula is a terrestrial animal that lives in deep burials that they make themselves and leave them only when in search for food. They make webs, but most of the time keeps living in the burials they make. Due to rain forest natural habitat, they need great humidity at all times if in captivity as pets. The Cobalt Blue Tarantula is a carnivore like most of their species. This means that it eats only live prey and they prefer catching it on their own. Their diet is mostly made of crickets, cockroaches and other small insects. 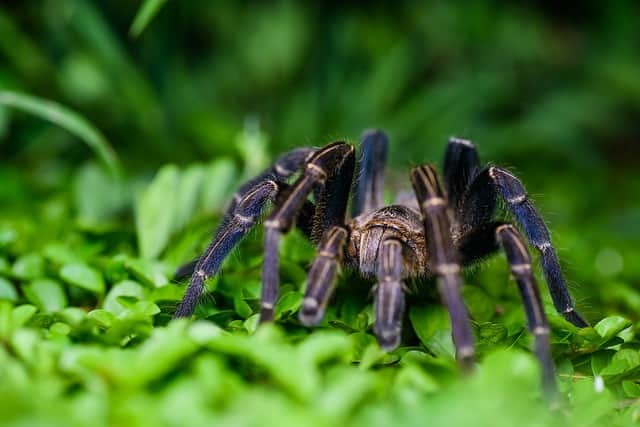 Be careful – the crickets might injure your tarantula, so if the Cobalt Blue is not interested in catching the cricket, remove it from the tank ant try feeding it a few days later. Also, they always need to have fresh water in the tank – you can leave a small water container or a tarantula sponge as a source of water. Like most of the tarantulas, the female Cobalt Blue Tarantula lives longer – up to 20 to 25 years. The male once, once they achieve maturity live for a few months more, so their life span is 10 to 20 years. The Cobalt Blue needs more ground space and not so much height. But, the terrarium needs to be high enough so they can’t climb and escape. They need as much as a 10 gallon tank with 5 to 6 inches of peat moss or potting soil. If the soil is covered in moss, make sure to keep open space for their burrow. Also, they need a great humidity, so the moss should be sprayed daily and fresh water needs to be provided. As a water container you could use wide and shallow water dish or a tarantula sponge. You should also provide an under-tank heating pad. Haplopelma lividum – Latin name. The temperature in the terrarium should be approximately 80-90 Fahrenheit (26-32C). The humidity should be around 72-82 percent at all times. Its recommended for the moss in the tank to be sprayed with water on a daily basis in order for the humidity to be on point. The Cobalt Blue is one of the most aggressive ones, meaning that they are easily scared and triggered to attack. It’s not recommended to be handled, especially not by someone without experience. It’s known that even the spiderlings of a Cobalt Blue tarantula are ready to attack. They are also very fast and can escape easily if the top of the tank is not secured or high enough to be out of their reach. The male gets closer and starts tapping while vibrating its body. If the female answers, the mating starts. After that, in some cases, the male might get eaten. The female Cobalt Blue Tarantula lays the eggs in her burrow and takes care for the sac.